Turkey Santa Fe Zucchini Boats are one of my favorites! 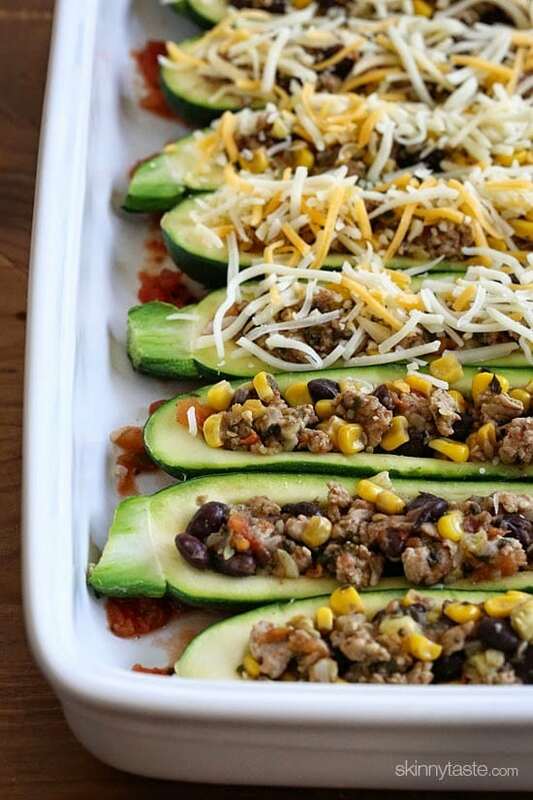 Hollowed out zucchini boats stuffed with a cumin spiced ground turkey and black bean mixture with summer corn and tomato, baked in the oven with melted cheese – YUM! 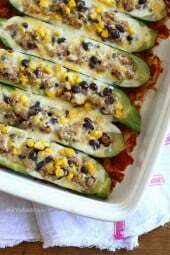 This recipe was inspired by my Sante Fe Turkey Stuffed Peppers which worked wonderful as a filling for these zucchini boats! If you’re like me and have so much zucchini you don’t know what to do with it, check out 35 Skinnytaste Zucchini recipes which includes a few other stuffed zucchini boat varieties. You can make this ahead and bake it when you’re ready to eat, it can also be prepared a day ahead or freeze whatever you don’t plan on eating to bake another day. 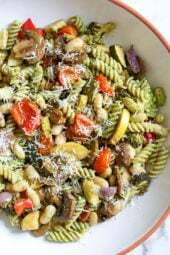 Leftovers also make a great lunch, my teenager loved these – enjoy! Hollowed out zucchini boats stuffed with a cumin spiced ground turkey and black bean mixture with summer corn and tomato, all baked in the oven with melted cheese – YUM! Bring a large pot of salted water to boil. Preheat oven to 400°F. Using a small spoon or melon baller, hollow out the center of the zucchini halves, leaving 1/4-inch thick shell on each half. Chop the scooped out flesh of the zucchini in small pieces and set aside 3/4 of a cup to add to the turkey filling, (squeeze excess water with a paper towel) discarding the rest or save to use in another recipe. In a large skillet brown the turkey and season with salt. When the turkey is browned, add onion, garlic, black beans, cilantro, serrano pepper, diced tomatoes, reserved zucchini and cumin. Mix well and simmer on low, covered for 20 minutes. Remove lid, add corn and simmer an additional 5 minutes or until all the liquid reduces. Place the salsa in the bottom of a large baking dish (or two medium size dishes) and place the hollowed out zucchini cut side up in the dish. 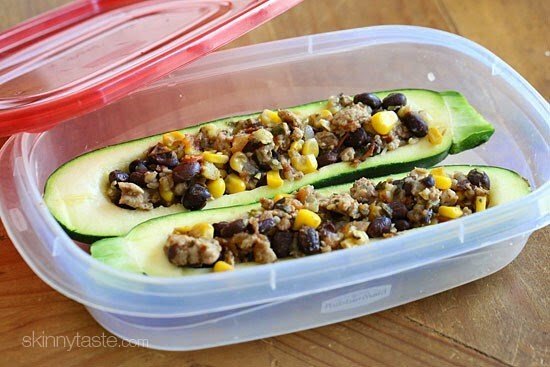 Using a spoon, fill the hollowed zucchini boats dividing the filling equally, about 1/3 cup in each, pressing firmly. Top each with 1 1/2 tablespoons of shredded cheese. I love this recipe for entertaining. * I can make it ahead and therefore spend time with my guests. It is my new “go to”!! This recipe has on my list to make for awhile now. I finally made it 2 nights ago. It took me about 2.5 hours to complete….therefore I put it in the fridge to consume the following day. Just thought I’d mention that because I didn’t realize how labor intensive it would be. I will probably not make it again just because of that. I put this nutritional info into my WW app, and it comes out to 7 SP. ? Hi Meg, you MUST use recipe builder when getting points. The SmartPoints® calculator isn’t meant for recipes and will often give you the wrong points (usually higher) because it’s counting 0 points foods such as eggs, chicken, fruits and vegetables. So if you see a recipe with a SmartPoints® value that’s different from what the calculator tells you, that is why. I tried this recipe for dinner this evening, my son told me this was a keeper! I’ll have to wait until later to see how the others like it. I made one small change, while my kids love zucchini, they don’t prefer a whole/half, they prefer diced or spiral. I just diced the zucchini, simmered it with a little water in a covered skillet until tender. I then layered the zucchini in the skillet added the salsa then meat mixture, topped with cheese and baked for 20 minutes. Love the recipes! Made recipe to the T as always.. delish!! Love zucchini! Freezes well too. Happy there are ratings on your site now so I can give you all the credit deserved for my most loved recipes of yours for the past many years. Thanks, Gina! I made this last night. It was a real hit whith the kids. Great way to get the kids to eat veggies. My four year old loved it. The flavors were an amazing combination. Thanks for the recipe, it’s a keeper. Why are we putting salsa on the bottom of the baking dish? I can’t figure out what purpose it serves. I made these last night and they were so yummy! 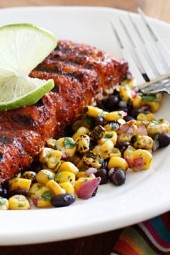 Perfect for a light summer dinner on the deck and very filling for 5sp! My son and husband loved them too. I did use 96/4 ground beef instead of ground turkey, which worked fine. Great alternative to the more traditional Italian inspired zucchini recipes. I am making these right now and I only have mozzarella cheese on hand.. Will that still be good? What a Great meal. I fixed this last night an my wife wanted seconds. I did not add any salt to the recipe, but used Trader Joes 21 seasoning salute, and canned diced tomatoes ” no salt added”, and low sodium salsa. Absolutely the Best zucchini recipe I have ever found! Awesome! added a little salsa to the mixture. YUM!! Yet again another Home run! Made that tonight for dinner they came out amazing!! Loved it will definitely make it again they were so filling to! I have everything to make this but am having second thoughts. I am concerned the zucchini I bought are too skinny. Its all they had. I did buy an extra one assuming I'd have filling left over. If you were going to freeze this would you freeze the zucchini boats fully assembled or freeze the filling and buy fresh zucchini? It looks so delicious! I bought some fresh zucchini (courgettes as we call them here in NL) on the market, so I will be making this tonight. I also love your cookbook, amazing recipes. These were amazing. I only had 2 zucchinis so I refrigerated the leftovers. The next day I spread it on warmed tortillas with some taco sauce and additional cheese and they were wonderful. Love all your recipes. I'm enjoying your cookbook-a gift from my son. Fixed this tonight and just loved the flavors. My ground turkey came in a 20 oz. container and I used all of it. I also used all of the can of black beans and about a cup of corn and salsa and all of the chopped up zucchini. Point is, that the flavor is so good that if you are a little over or under, it is a great taste. Will be doing again for sure. Thanks. When you say to scoop out the zucchini & then save it to add in later. Do you mean seeds and all? No I get rid of the seeds. I made these and there was a TON of water in the bottom of the baking dish when I took it out of the oven. the zuchinni were mush. What did I do wrong? I remember i used to do something similar with aubergines. Definitely going to give this one a try. Yeow…lighten up "Unknown"! Constructive criticism is allowed. I was going to suggest that listing 15 tbsp of Mexican cheese was a little cumbersome. Wouldn't just saying 1-1/4 cups be a lot easier? between the frequency of the "reviving this from the archives" posts and the sponsored posts pushing some product for pay (some identified as sponsored, many not), not much original or non commercial content here anymore. Loved the blog and the cookbook, but the lack of original and unsponsored content is getting old. Enjoyed it, but nothing new here to warrant repeat visits anymore. Sorry this isn't more "positive" but hope it is at least "helpful". Shes working on writing her second cookbook….all while running a business, writing a blog and still making time for her family..Get over yourself!!! You dont pay her bills or sign her checks… we get all her recipes on the blog for FREE but you sit there complaining that she does sponsored posts and recycles a recipe here and there?? You are a snob who's sense of entitlement is disgusting! Do you really have to boil the zucchini for one minute. Can I do it the easy way and just bake the whole thing? I slice the zucchini thin and layer on top of salsa, then add turkey mixture. My family tends to eat more zucchini that way! I freeze cilantro, and while it might not look as pretty, it tastes great. Yummy, these look so delicious! Come see my favorite picks from the Nordstrom 1/2 Yearly Sale! These are great and that is coming from someone who is trying to eat more veggies. The only problem I had was with freezing them. The zucchini is so watery once frozen. I think the next time I will make the stuffing and only use what I am going to eat at that time for one or two servings. I will freeze the rest in portions and get fresh zucchini each time I am ready to have them again. If baking from frozen, what bake time would you suggest? I made this for dinner last night. It was just okay. I thought it lacked a lot of flavor. My husband also said it was alright, but probably not worth the time making it. What's the best way to reheat this? Do you eat the peel? I made these last week, but since I'm a vegetarian, I left out the turkey and added all of the zucchini "guts." They were delicious!!! I made these today I used summer squash and left out the corn…I used fresh mozzarella and a little fresh parmesan for the cheeses…delicious!!!! I made these last night exactly as the recipe and they were just the best,best! I have a new go to recipe! I'm stoked. I'd also like to mention that there is a frozen pkg. of corn/blk beans/red pepper put out by C&h I believe,I've always loved that pkg. and so I used it in place of 1/2c.of beans;1/2cup of corn. etc. it was just awesome. Thank you very much. I've put just about every meat concoction into a zucchini boat lately! chili, sloppy joes, pulled pork, spaghetti sauce, shredded chicken taco filling, barbacoa pork, leftover teriyaki marinated grilled steak(that i thinly sliced and then chopped. added some rice and a little more teriyaki sauce). It's all good!! the zucchini is such a mild flavor that it's like rice, pasta or potato.. just about anything can top it! My next attempt will be beef stroganoff (leftovers) on some! Those zucchini boats look fantastic. I am going to make myself some this weekend. It's such a simple recipe too. Thank you for always sharing such great ideas. Wow! These look amazing- what a great idea! 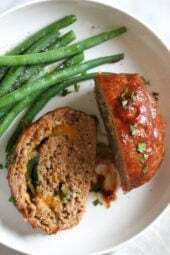 I love ground turkey, but would like to try a meatless version, too, since we just eat meat a few days per week. We'd still get plenty of protein with the beans! My lazy girl short cuts: I don't like leftover ingredients, and I love to have stuff in the freeze so what I did was double the recipe – that will use almost all of a whole can of black beans. Each single recipe needed one ear of corn, which I cooked in the husk in the microwave, let cool, then quickly shucked (SO easy!) and cut off the cob. I've learned from Gina's recipes that pickled jalepeno is easy to keep in the fridge and I'm not running out to buy one here and there. Finally, because the small zucchini are hard to find outside your own garden, I used a larger zucchini to make one large "boat" which I cut into portions. I find the larger zucchini hold up to freezing better, too. Now – can someone solve a problem for me? I love the taste of cilantro, but these recipes that need just a little bit of the very perishable herb drive me nuts. Living in NE, it's either too cold much of the year, or my potted cilantro has bolted in the hot weather…. Walmart sells cilantro in the freezer section. It is 12 mini ice cube type blocks. My family doesn't "like" anything with ground turkey, real meat & potatoes men (wink, wink), well they LOVE this. Your recipes are always spot on and I never tweak them until I have made them exactly as the recipe calls for. Last night I realized I had no serrano or even jalapeno, so I substituted some ground chipotle this time, and it was fantastic! Thanks Gina for always keeping my menu healthy & delicious! We made these last night (reminding our two boys that they LOVE zucchini in turkey burgers! ), and they were a huge hit! They had such great flavor. Instead of boiling the boats, though, we always grill them. Wonderful! Thanks for another great recipe. My husband does not like cumin. Is there a different spice I could substitute? Sure swap it for chili powder or just leave it out. This is my kind of dinner! So awesome! Looks delicious! I bet this filling would be good in squash too. Looks delicious. 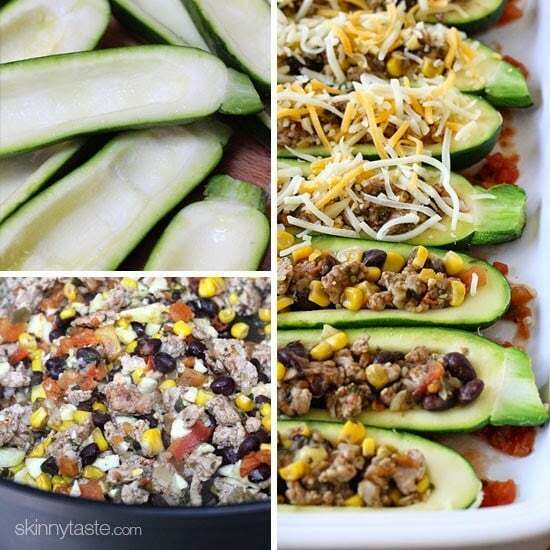 I love your traditional zucchini boat recipe so I'll definitely try these! Yum! I feel like so many squash recipes are Italian-inspired that it's nice to see one with a little Southwestern flair. And with leftovers…perfect for someone like me who cooks on Sunday so she can eat through Wednesday. 🙂 Thanks for sharing! I did this exact same thing about a month ago. I made your stuffed peppers but one person who was over did not like peppers so I stuffed zucchini for her. It was a hit!